I have 2 male puppies from the same litter. They are now 9 months old. We also have the Mother who has been ours for 5 years. Can 2 males live in peace together? Do they HAVE to be neutered? We walk and exercise them together with no problems. When they play in the back yard we have had a few scuffs and some seem to be getting a little out of hand. No blood but, there is a lot of teeth clashing. They are under constant watch when together. They are in separate playpens but next to each other when in the house. They eat together just fine. Will this work out as they mature? Or will it get worse? My heart would break if they get hurt. Total German Shepherd: I have to tell you up front that if they were my boys that they'd already be neutered - long ago. Things will only get worse because these boys are walking hormones on four legs. And a lot of issues are going to rise as they mature - and if they remain un-neutered it's not gonna be nice. Plus the whole area of dominance issues - that's another thing entirely. But they'll have to work this out between the two of them too. Discuss the issues you're having now with them with your vet and see what he says - ask if he thinks neutering will help. Just remember though that that will not solve the entire issue but it will help (not to mention all the health benefits). Just don't forget that training and socialization needs to be done too. And loads of it with both dogs. If you can get them in a dog training class then that would be best but if not at least work on it at home. And if you're not sure of a dog training class to work on at home below is one you might want to check out. Just click on the link below (eventhough it says its about potty training) and you'll see a short video of a lady with 4 GSDs who used his training methods - both before she trained the dogs and then afterward. Really amazing results. Either way, whatever you decide, good luck with your boys. 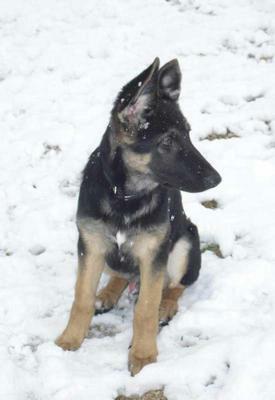 Comments for 2 Male German Shepherd puppies living together in peace? hi deb, where did you get your pups? i got mine from oviedo fl. i agree with the avice given they are both competing for dominence. for some reason a female can dominate a male. but like in any species, men all want to be top dog.